Uniform is optional for children, though we know many parents like to put their child in a uniform as part of the routine for getting ready for school. 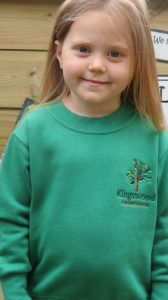 Kingswood offer a green sweatshirt and white or green polo shirts. These can be ordered online through Gooddies. School book bags can be purchased from the office at a cost of £5 each.